Follow the links to see a list of the ships that the Ellis Island Knapp's arrived on. Follow the links find information about these ships. Built by Fairfield Shipbuilding & Engineering Company, Glasgow, Scotland, 1890. 8,810 gross tons; 500 (bp) feet long; 57 feet wide. Steam triple expansion engines, twin screw. Service speed 18 knots. 2,594 passengers (432 first class, 162 second class, 2,000 third class).Three funnels and two masts. Built for Hamburg-American Line, German flag, in 1890 and renamed Normannia. Hamburg-New York and Mediterranean-New York service. Sold to Spanish Government, Spanish flag, in 1897 and renamed Patriota. Troopship and auxiliary cruiser service. Laid-up in 1898. Seized for debts by the French Government in 1899. 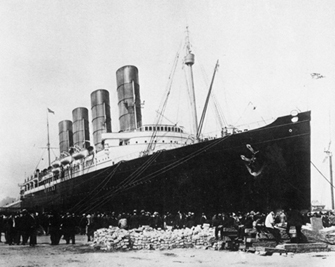 Transferred to French Line, French flag, in 1899 and renamed L Aquitaine. Le Havre-New York service. Scrapped in Scotland in 1906. Built by Chantiers de la Mediterranee, La Seyne, France, 1886. 7,395 gross tons; 495 (bp) feet long; 52 feet wide. Compound engine, single screw. Service speed 17.5 knots. Two funnels, four masts, iron and steel construction. Built for French Line, French flag, in 1886 and named La Bourgogne. Le Havre-New York service. Sunk following a collision off Newfoundland, 549 lives lost on June 4, 1898. Built by Compagnie Generale Transatlantique, St. Nazaire, France, 1886. 6,756 gross tons; 508 (bp) feet long; 51 feet wide. Compound engines, triple screw. Service speed 17 knots. 1,060 passengers (402 first class, 60 second class, 598 third class).Two funnels and four masts. Built for French Line, French flag, in 1886 and named Le Bretagne. Le Havre-New York service. Sold to Compagnie Sud-Atlantique, French flag, in 1912. France-South America service. Renamed Alesia in 1919. Scrapped in Italy in 1923. Built by Compagnie Generale Transatlantique, St. Nazaire, France, 1885. 7,087 gross tons; 507 (bp) feet long; 51 feet wide. Compound engine, single screw. Service speed 17 knots. 1,055 passengers (390 first class, 65 second class, 600 third class).Two funnels, four masts, rebuilt 1896 with two masts, 1500 third. 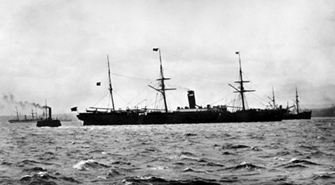 Built for French Line, French flag, in 1885 and named La Champagne. Le Havre-New York service. Le Havre-Gulf of Mexico service after 1905. Wrecked off St. Nazaire on April 28, 1915. Built by Swan, Hunter & Wigham Richardson Limited, Newcastle-upon-Tyne, England, 1922. 19,680 gross tons; 623 (bp) feet long; 73 feet wide. Steam turbine engines, twin screw. Service speed 16 knots. 2,180 passengers (340 first class, 340 second class, 1,500 third class).Two masts, one funnel. 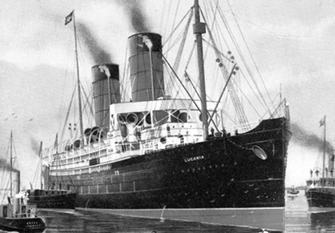 Built for Cunard Line, British flag, in 1922 and named Laconia. Southampton to New York, troopship in World War Two service. Sister ships were SAMARIA and SCYTHIA. Sunk by a German submarine in the South Atlantic on September 12, 1942. Built by Fairfield Shipbuilding & Engineering Company, Glasgow, Scotland, 1887. 5,681 gross tons; 464 (bp) feet long; 49 feet wide. Steam triple expansion engine, single screw. Service speed 18.5 knots. 1,030 passengers (224 first class, 106 second class, 700 third class). Built for North German Lloyd, German flag, in 1887 and named Lahn. Bremerhaven-New York service. Sold to the Russian Navy in 1904 and renamed Russ. Scrapped in 1927. Built by Caird & Company, Greenock, Scotland, 1875. 5,491 gross tons; 513 (bp) feet long; 44 feet wide. Compound engine, single screw. Service speed 16 knots. 1,770 passengers (170 first class, 100 second class, 1,500 third class).One funnel and three masts rigged for sail. Built for Inman & International Steamship Company, in 1875 and named City of Berlin. Liverpool-New York service. Rebuilt in 1879 for triple-expansion engines and electric lights. Sold to American Line, in 1893 and renamed Berlin. Southampton to New York service. 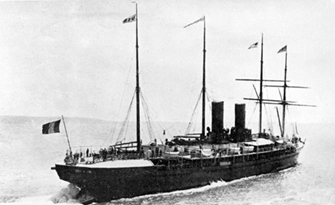 Chartered by Red Star LIne for Antwerp to New York 1895 to 1898. Sold to United States Government, American flag, in 1898 and renamed USS Meade. Damaged by fire at San Francisco Jan 1906. Scrapped in 1921. Built by Harlan & Wolff Limited, Belfast, Northern Ireland, 1909. 17,540 gross tons; 620 (bp) feet long; 70 feet wide. Steam quadruple expansion engines, twin screw. Service speed 17 knots. 2,536 passengers (394 first class, 352 second class, 1,790 third class). 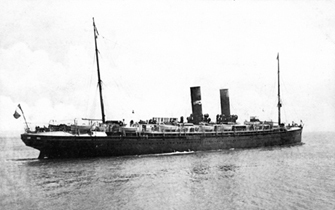 Built for Red Star Line, British flag, in 1909 and named Lapland. Antwerp-New York service. Sold to White Star and Dominion Lines, in 1914. Became a troopship in 1917. Returned to Red Star Line, British flag, in 1920. From 1926-33 primarily cruising service. Broken up in Japan in 1934. Built by Forges et Chantiers de la Mediterranee, La Seyne, France, 1887. 7,090 gross tons; 507 (bp) feet long; 51 feet wide. Compound engine, single screw. Service speed 17 knots. 1,055 passengers (390 first class, 65 second class, 600 third class).Two funnels and four masts. Built for French Line, French flag, in 1887 and named La Gascogne. Le Havre-New York service. Scrapped in 1920. Built by Compagnie Generale Transatlantique, St. Nazaire, France, 1899. 11,146 gross tons; 580 (bp) feet long; 60 feet wide. Steam triple expansion engines, twin screw. Service speed 21 knots. 1,114 passengers (446 first class, 116 second class, 552 third class).Two funnels and two masts. Built for French Line, French flag, in 1899 and named La Lorraine. Le Havre-New York service. 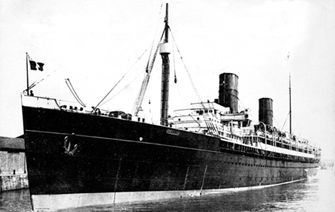 Served as an armed merchant cruiser during World War I as LORRAINE II. 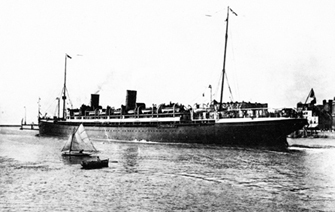 Resumed Le Harve-New York service in 1919. Scrapped in 1923. Built by Robert Napier & Sons, Ltd., Glasgow, Scotland, 1896. 3,445 gross tons; 345 (bp) feet long; 44 feet wide. Steam triple expansion engine, single screw. Service speed 12 knots. Two masts, one funnel. Built for Royal Mail Steam Packet Company, in 1896 and named La Plata. 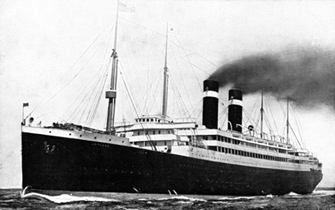 Sold to Booth Line, British flag, in 1900 and renamed Clement. South American ports and Barbados to New York service. Renamed Freshfield in 1916. Canadian and US ports service. Loss commemorated on memorial at Halifax, Nova Scotia. Torpedoed and sunk on August 5, 1918. Built by Chantiers de Penhoet, St. Nazaire, France, 1906. 13,753 gross tons; 627 (bp) feet long; 65 feet wide. Steam triple expansion engines, twin screw. Service speed 21 knots. 1,362 passengers (422 first class, 132 second class, 808 third class).Two funnels and two masts. 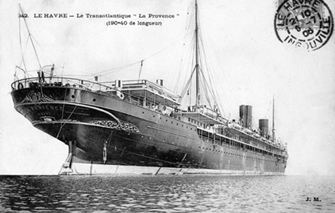 Built for French Line, French flag, in 1906 and named La Provence. Le Havre-New York service. Refitted as the French Navy Auxiliary cruiser Provence II in 1914. 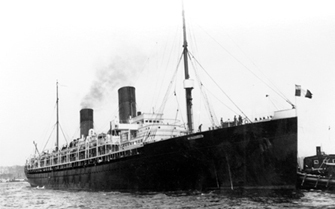 Torpedoed in the Mediterranean by a German U-boat; 930 lost on January 26, 1916. Built by Chantiers de Penhoet, St. Nazaire, France, 1901. 11,168 gross tons; 580 (bp) feet long; 60 feet wide. Steam triple expansion engines, twin screw. Service speed 20 knots. 1,055 passengers (437 first class, 118 second class, 500 third class).Two funnels and two masts, refited 1923 for 430 cabin, 613 third. Built for French Line, French flag, in 1901 and named La Savoie. Le Havre-New York service. Refitted as a French Navy auxiliary cruiser in 1914. 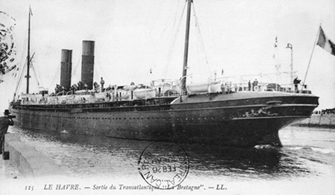 Resumed Le Harve-New York service 1919-27. Scrapped at Dunkirk in 1927. Built by Chantiers de Penhoet, St. Nazaire, France, 1891. 9,047 gross tons; 520 (bp) feet long; 56 feet wide. Steam triple expansion engines, twin screw. Service speed 19 knots. 1,090 passengers (392 first class, 98 second class, 600 third class). Built for French Line, French flag, in 1891 and named La Touraine. Le Havre-New York service. Used as a floating hotel at Gothenburg, Sweden in 1923. Renamed Maritime in 1923. Scrapped in France during January of 1923. Built by Barclay Curle & Company, Glasgow, Scotland, 1908. 8,596 gross tons; 475 (bp) feet long; 57 feet wide. Steam triple expansion engines, twin screw. Service speed 16 knots. Two funnels and four masts. Built for Russian American Line, in 1908 and named Russia. Libau-New York service. Laid up at Kronstadt, Russia August 1914 because of World War I. Transferred to other Russian owners, in 1917 and renamed Rossija. Renamed Russ in 1921. Sold to Baltic-America Line, Danish flag, in 1921 and renamed Latvia. Libau-New York service. Sold to Osaka shosen Kaisha, Japanese flag, in 1924 and renamed Fuso Maru. 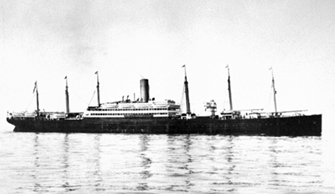 Renamed Huso Maru in 1924. Lost during World War II in 1942. Built by Blohm & Voss Shipbuilders, Hamburg, Germany, 1914. 54,282 gross tons; 950 (bp) feet long; 100 feet wide. Steam turbine engines, quadruple screw. Service speed 23 knots. 3,909 passengers (752 first class, 535 second class, 2,622 third class). 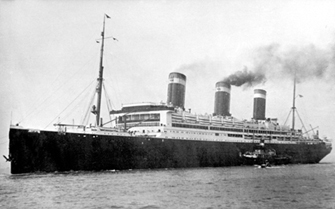 Built for Hamburg-American Line, German flag, in 1914 and named Vaterland. Hamburg-New York service. Interned in NY start of WWI 8/1914. Largest liner in the world 1914-21. Seized by U.S. authorities, in 1917 and renamed USS Leviathan. Troopship service. Laid up 1919-21. Restored as passenger ship 1922-23. 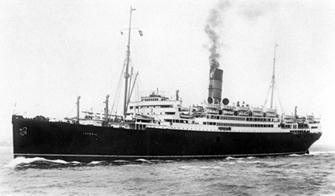 Chartered by United States Lines, in 1923 and renamed Leviathan. New York-Southampton service. Laid up 1932-34. Briefly resumed sailing in 1934. Laid up thereafter. Scrapped in Scotland in 1938. Built by Harlan & Wolff Limited, Belfast, Northern Ireland, 1907. 18,168 gross tons; 616 (bp) feet long; 68 feet wide. Steam quadruple expansion engines, twin screw. Service speed 14.5 knots. 1,480 passengers (324 first class, 152 second class, 1,004 third class).One funnel and six masts. Built for Leyland Line, British flag, in 1907 and named Scotian. 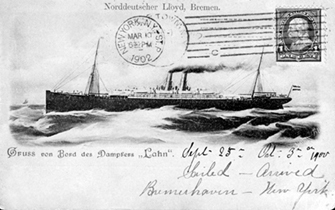 Sold to Hamburg-American Line, German flag, in 1907 and renamed Berlin. Renamed President Lincoln in 1907. Hamburg-New York service. Laid up at New York in 1914. Seized by US Government, in 1914 and renamed USS President Lincoln. Sunk in the Atlantic by a German U-boat on April 31, 1918. Built by Armstrong, Mitchell & Company, Newcastle, England, 1892. 5,617 gross tons; 421 (bp) feet long; 48 feet wide. Steam triple expansion engines, twin screw. Service speed 13.5 knots. 1,116 passengers (84 first class, 32 second class, 1,000 third class). Built for North German Lloyd, German flag, in 1892 and named Lucania. Bremerhaven-New York service. 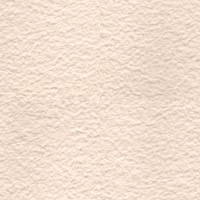 Completed as H.H. MEIER. 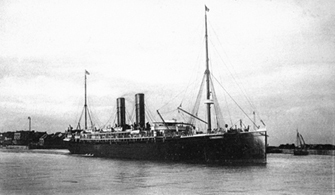 Sold to Compania Transatlantica Line, Spanish flag, in 1901 and renamed Manuel Calvo. Barcelona-New York-Caribbean service. Damaged by a mine off Turkey; later repaired and resumed service. Laid up Spanish owners, in 1952 and renamed Drago. Scrapped in Spain in 1958.